(Nanowerk News) Some sea creatures cover themselves with hard shells and spines, while vertebrates build skeletons out of the same minerals. How do these animals get the calcium they need to build these strong mineral structures? Professors Lia Addadi and Steve Weiner of the Weizmann Institute of Science's Structural Biology Department asked this question about sea urchins, which need to extract quite a few calcium ions from sea water to build their spines. The answer surprised them, and it could change the way scientists think about the process of biomineralization (PNAS, "Calcium transport into the cells of the sea urchin larva in relation to spicule formation"). Several years ago, Addadi and Weiner had discovered that sea urchins build their spines with tiny packets of "unorganized" material that hardens into crystal when laid in place. "So the question went back a step: How do they get the calcium ions they need to make this material in the first place?" says Addadi. "Free calcium is not abundant in sea water," adds Weiner, "so they need an efficient way to extract and concentrate the ions." To answer the question the researchers, including Netta Vidavsky, needed methods to observe the animal's cells "as is," that is, as they are in life, water included. For this the group turned to Dr. Andreas Schertel of Carl Zeiss Microscopy in Germany and Dr. Sefi Addadi of the Weizmann Institute of Science's Life Sciences Core Facilities. 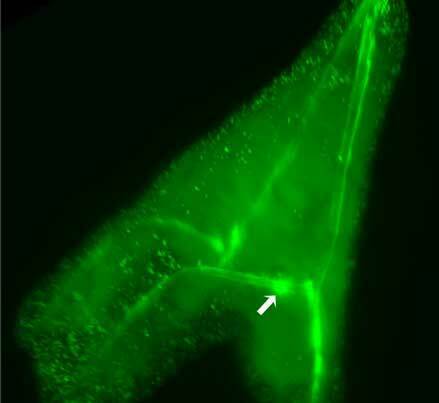 Very new cutting-edge techniques enabled them to observe thin slices of the cells in sea urchin embryos and then to reconstruct three-dimensional images of these cells and their intake of labeled calcium ions. "Even a few years ago, we could not have done this study," says Addadi. The images showed that sea urchin larval cells actually "drink" seawater, taking in drops of water and manipulating the ions in the water within the confines of the cell. This is in contrast to the theory that these cells take in only ions, one at a time, through special channels in their outer membranes. The cells they observed were filled with networks of bubbles called vacuoles that collect the calcium ions, evidently creating concentrated packages of calcium for building the spines. This method may be more energy efficient than taking in ions through channels (which the cells also did), but it presents another problem: The cells must be able to pick out the calcium as well as expel other ions in the sea water, especially the sodium and chloride. "Researchers may be busy for years to come figuring out how these cells manipulate the ions in the sea water they drink," says Weiner. Addadi and Weiner point out that this is not the first time this type of calcium ion intake has been observed. Prof. Jonathan Erez of the Hebrew University of Jerusalem had described this phenomenon in single-celled, hard-shelled microorganisms called foraminifera a decade ago. At the time, it was thought to be a "curiosity," but finding the same process in two very different creatures suggests that it may be quite widespread. Although we do not live in sea water, even the cells that build our bones may use a similar method to obtain calcium.